I've been playing with jewelry a lot lately. There's something really fun about wearing your own creations! The NEST necklace I made needed something else so I made a second piece to go with it. I'm kinda mad that I didn't notice the chain was messed in the photo, but I'm feeling too lazy to fix it!! LOL!! I just used stuff I had here in m studio. 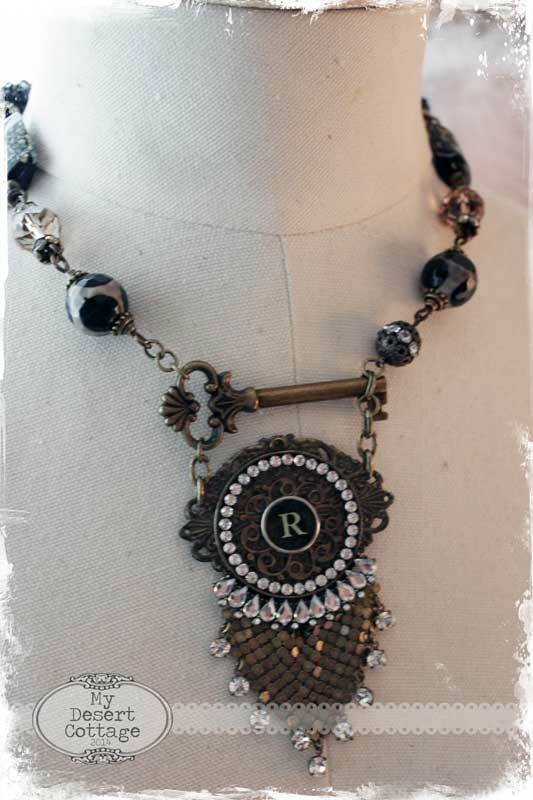 I wanted to keep the mix of metals so there is shiny silver, brass and tarnished silver for the chain. I also used a key on this one. I normally tend to prefer the tarnished silver look , but brass has been growing on me! It took lots of separate elements to make the focal piece. All of it was fused together using E-6000. This one is for when I really want to make a statement! That vintage broach is almost 3 inches of blingy goodness!! 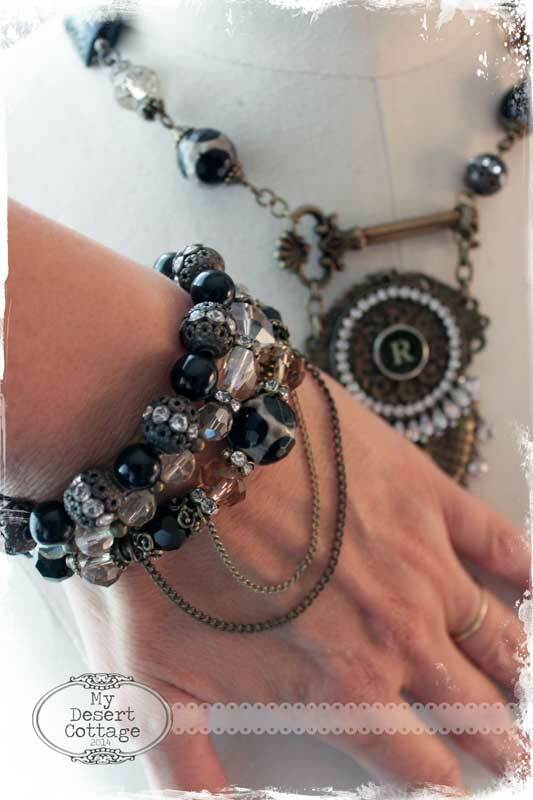 This last bracelet was so easy to put together! I already had a bracelet that I bought several years ago that had broken, but had lots of charms on it. I just took it apart and used jump rings to attach to this vintage rhinestone bracelet! While I have been collecting vintage bits and baubles for a couple of years now, all the beads, wire, and findings were found at one the big 3 craft stores here in Phoenix. I do love to play with solder too, but sometimes you just want to put something together fast!!! You are a lady of many talents Karen. I like all the jewellery but the necklace with the bird nest is my favourite. Oh Karen....your jewelry is fabulous....I want those kind of bracelets too, cuz no clasps....you really made some gorgeous pieces! I think these all make bold, beautiful statements--wow! 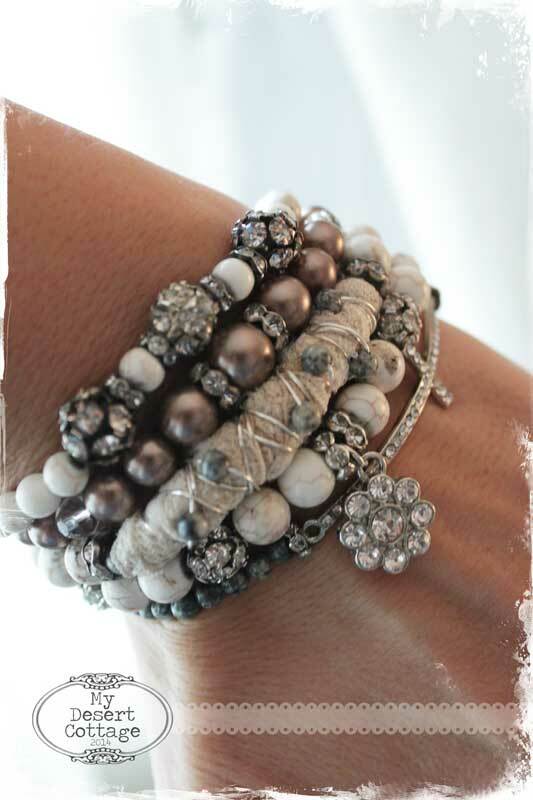 I love the mix of textures and I agree with you about the stretch bracelets being so much easier. I'd be playing with jewelry too if I were that talented..It's beautiful Karen..
Everything is gorgeous - but I'm in LOVE with the bracelets!!! Love that they are stretchy too. Mr OP is never around to help me with my clasps so once I get one on it stays on for awhile. You really created some one of a kind pieces, Karen, you are good!! 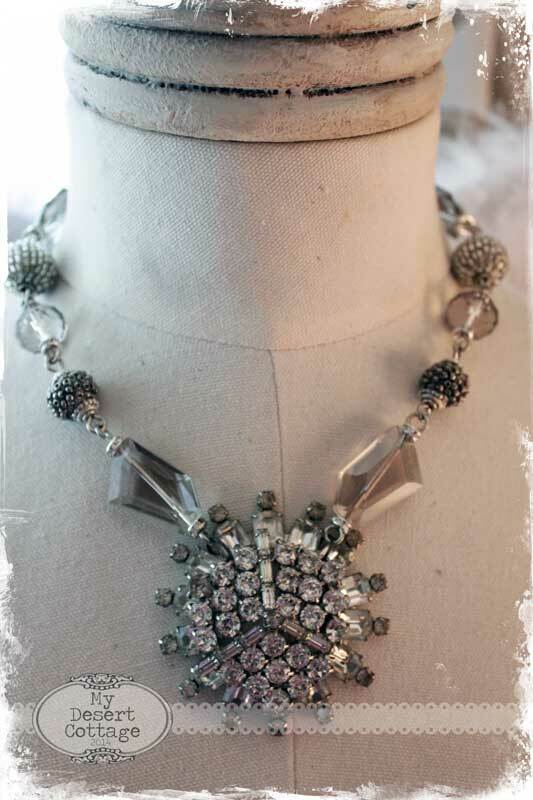 I really love that large brooch necklace, it's amazing!! Beautiful pieces, Karen. 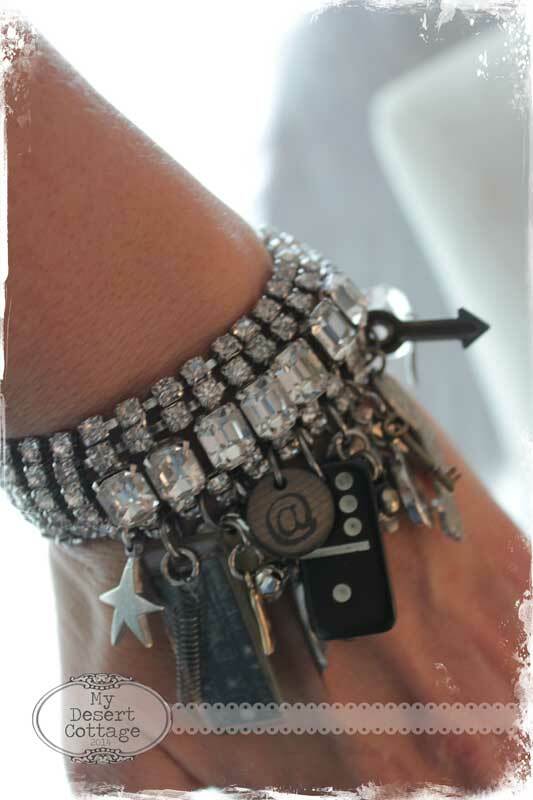 I'm with you on the stretch bracelets although I recently found a rhinestone one like yours and am crazy over it! It's so comfortable on my wrist. Can't wait to see you in a few weeks! love what you've created.. fabulous! Ahhhh! These pieces are Lovely! 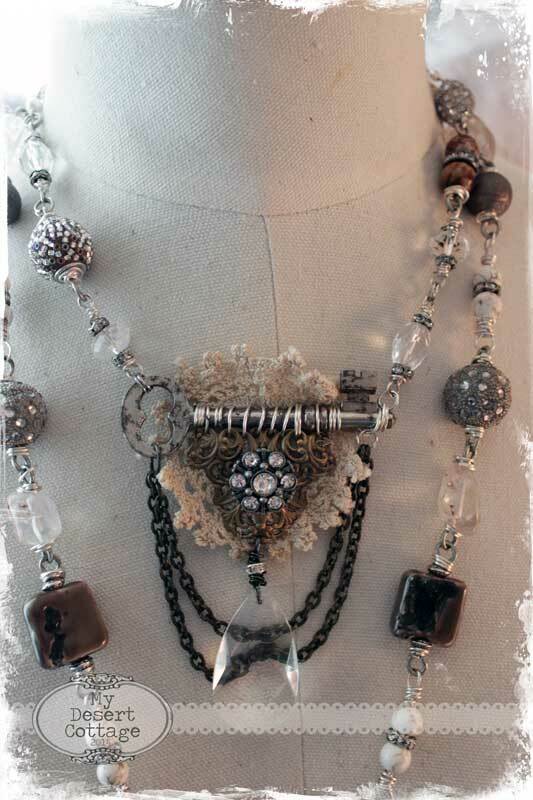 Love the vintagey look and details! Thanks for sharing! 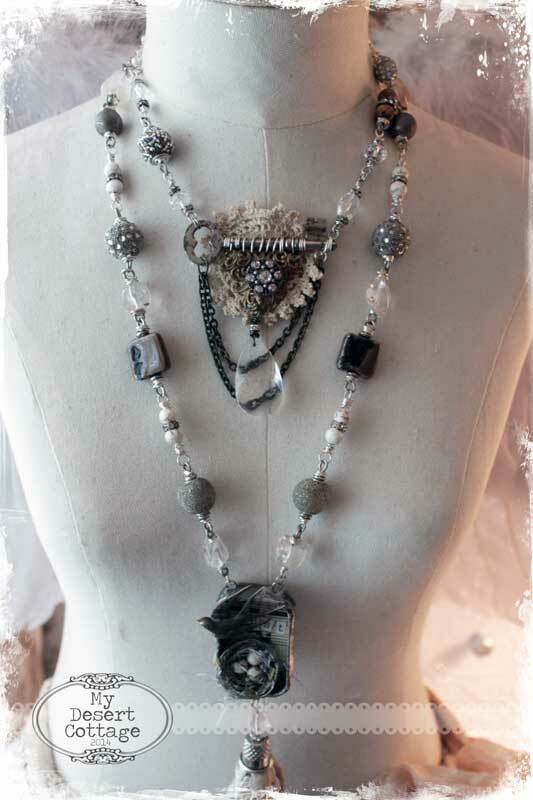 Love it all....makes me want to stop sewing make some jewelry for a while!! Just not enough hours in the day! MULTI talented! These are all so beautiful and so creative... it's time to hit some sales and get my bling stash up! I remember being a little girl and playing with all my Gramma's costume and vintage jewelry, have no idea what happened to it but I wish I could get my hands on it now! Your new creations are beautiful. Love the look of the bracelets. You are a very talented lady indeed. Thanks for sharing your work. All so beautiful Karen!!! LOVE!!! Lovely pieces! I haven't tired jewelry creating yet! Those are so pretty, Karen! I especially like how you used the keys and the tiny doily. It's always fun and inspiring to read your posts! You're so creative. I want to check out your bird nest necklace next. I am really loving the look of your bracelets. I have shopped our local mall and can't find anything similar. I was wondering if you know of an Etsy vendor or other place where I could buy them. I thought of making them, but I am afraid to tie the knot in the elastic thread.